I think RSS and blogs and news aggregators had finally gotten the best of me. There were literally hundreds of subscriptions haunting me each day; a bright red counter showing unread posts creeping up into the thousands. As my partner Lane puts it, “I feel like I make things un-bold for a living now.” He’s referring to the unending accumulation of things that need to be changed from “new” to “read” – email, lists, blogs, comments … even new music and the junk on our Tivos. So I switched off the preference to show unread things in the dock. Whew. Then I pruned aggressively. I created a simple classification system for the feeds I was left with, with nothing floating around outside, mostly because I cheated with a miscellaneous category – a digital junk drawer – the librarian’s bane. But I don’t really care. Reading blogs is only partially about staying abreast of current events, be it Fallouja or validating XHTML. Sometimes, it’s just about looking for inspiration, being entertained, or simply wasting time. And that is exactly how I like to classify stuff. dont' miss Couple of news sources, feeds for where my friends are going via upcoming.org, Netflix queue, and Merlin's 5ives. Gotta get my Tivo 'Now Playing' in here. family Feeds from Leslie, Greg, and Amy, plus their flickr photos. friends Feeds from people I hang out with, industry and othewise. 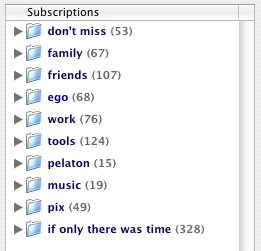 ego Subscriptions to searches on my name and urls with services like Technorati, PubSub, and Bloglines. Also, feeds on veen.com comments and traffic statistics. I like to know what people are saying about me, don't you? work Project feeds from Basecamp, internal wiki changes, recent documents uploaded to our intranet. Feeds from my coworkers and partners like Doug and Nadav. tools Things I use that get updated a lot: del.icio.us, Flickr, Feedburner, Six Log, Basecamp, etc. If you make something on the Web that has an audience, you better get it together and publish a feed. Seriously. peloton Some domestic but mostly European cycling. Racing coverage and a couple fan blogs. music A variety mp3 blogs, my favorites: Teaching The Indie Kids to Dance Again, largehearted boy. pix Beautiful work from Tim, Heather, Matt, and all my cameraphone-wielding friends at Flickr. if only there was time boing boing, Engaget, TMN, stuff about content management, search engine stuff, Zeldman and scores of other CSS/XHTML/design/validate/tips-n-tricks, a bunch of del.icio.us subs, lots and lots of sundry feeds picked up along the way. update: Yes, I realize “peloton” is spelled wrong in the screenshot. I studied Español in school, so cut me some slack.